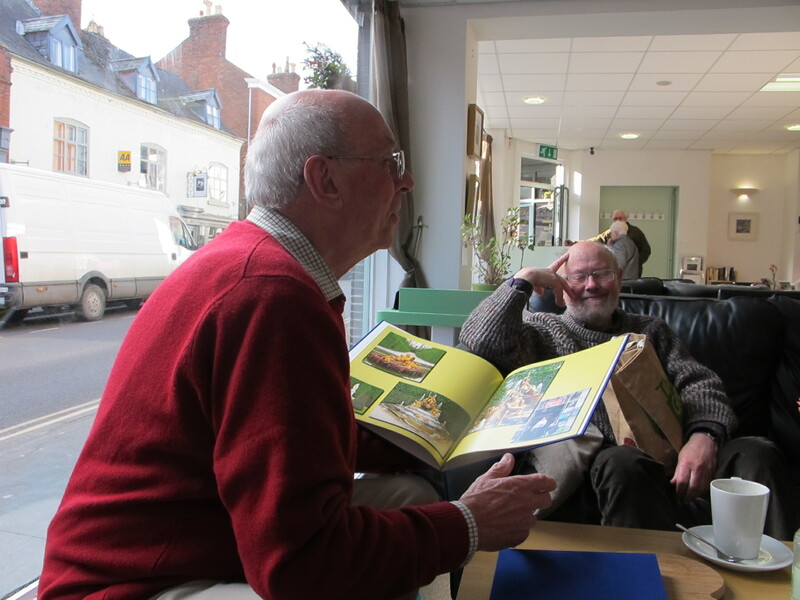 Great get together today at The Willow Gallery Oswestry! Thanks to all who contributed. Great to see everyone today, especially some faces who have been off the radar for some time. Also good to welcome Irene and Steve from Underhill farm. (Note to self – must remember to send Irene stretcher details!) 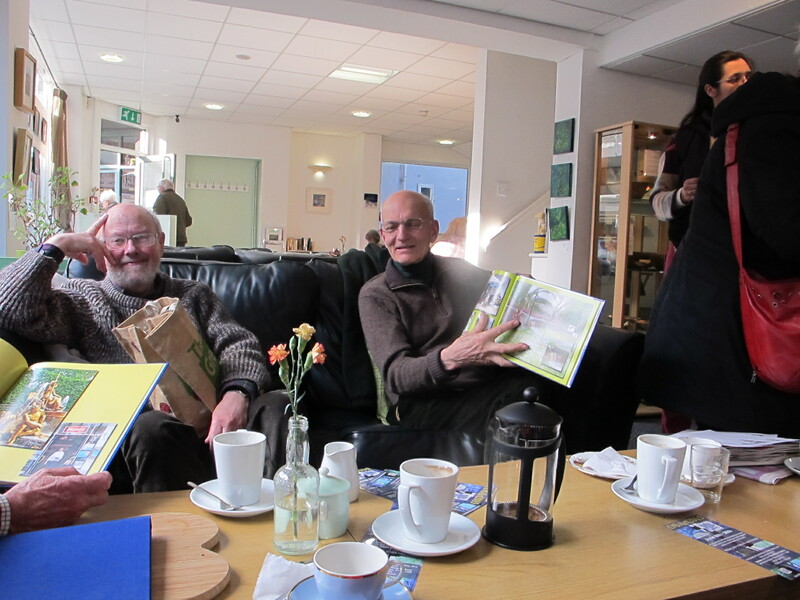 We had lively discussion with lots to share, learnt some new tips from each other, saw some beautiful sketches – Des’s tiny sketch book is a shear joy to look at, Chris shared her M.A. ideas for glass and ceramics, Dorothy updated us on her success with small pots, John explained his lino printing processes, Rob had been using water colours in different ways, Geoff had made several books of super photographs, photos, and Myra explained her exploration of 2D and 3D works, and we shared information on exhibitions, materials and courses. 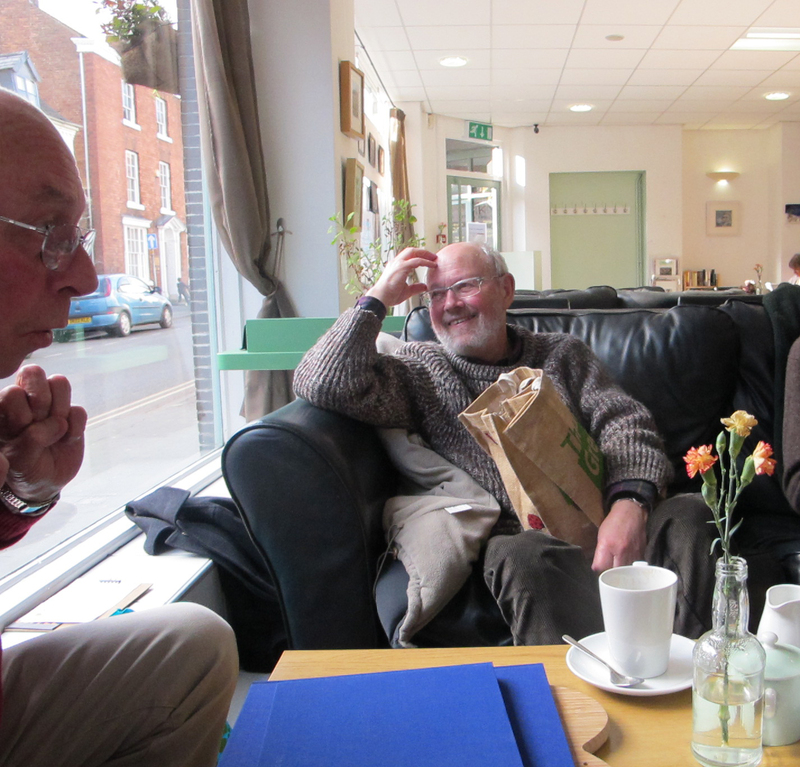 A lovely afternoon with the usual high class cafe refreshments! 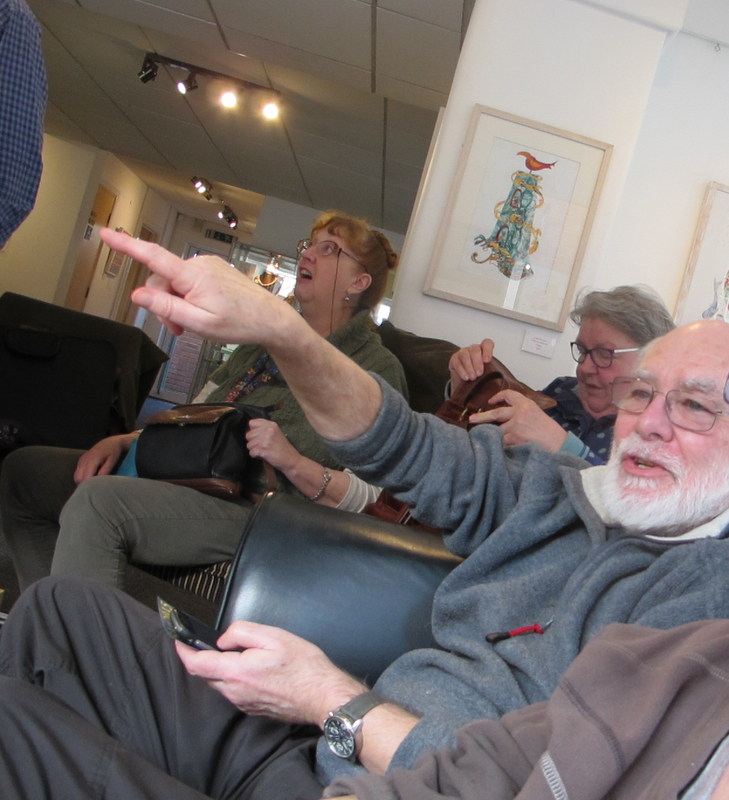 Footnote: Rob and Diana visited the Library afterwards to take a look at the Requiem exhibition – pictures below, and a glimpse at the Borderland Visual Arts section where Tony Roberts, glass sculptor has some works displayed. “I began work on ‘Requiem’ in June 2014. 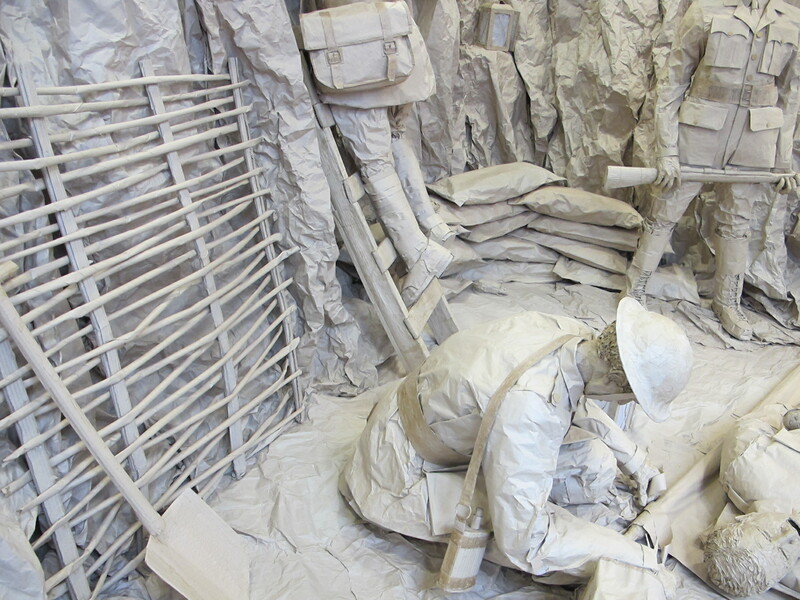 The Installation itself depicts four figures, a Patrol Officer, Medic, Wounded Soldier and Sentry, all engaging in Trench Warfare. 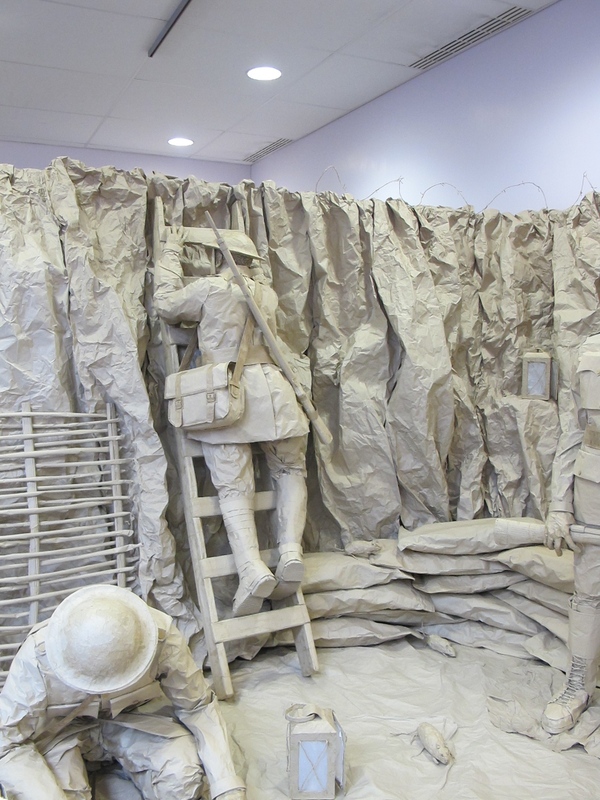 Based on a lot of research and made using brown paper, the piece was finally ready for public display at The Shrewsbury Flower Show on the 8th August 2014. My Installation stirred the interest and emotions of so many. From children asking how many rats were in the installation, to War Veterans, inquiring about the Gun type held by the Soldiers (a Lee Enfield). I created this World War One sculptural Installation with the greatest respect to all those who fought, and were affected by World War One. However, the piece allows viewers to reflect on the lives lost and sacrifices made in, not only The Great War, but all Wars since then, even up to the present day. It is this multigenerational relevance which I find most moving and poignant about the piece; it merges history with the present, conjuring a single requiem to lost life as a result of War.